We have added a new page on Post Surgical Continued Pain (aka FBSS) Lower Back Pain Relief with Cox Technic. Today's chiropractic practices are seeing so many patients now who have already had back surgery of some sort. Cox Technic is a gentle, safe, documented means to relief for these post-surgical back pain patients. Two interesting articles on these patients come from Dr. Ralph Kruse and Dr. Jerrilyn Cambron: a case report of one patient and a review study of 32 FBSS patients. Now is the time to tell patients what Cox Technic can do. 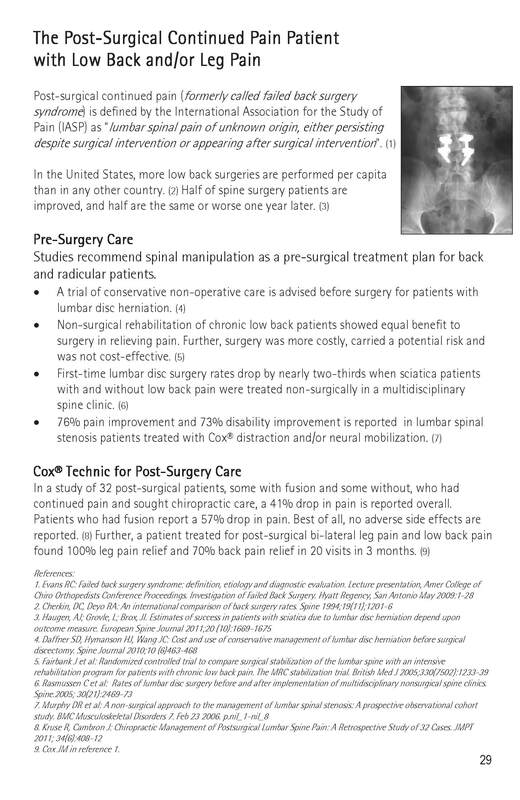 A page description of the PSCP patient and positive outcomes with chiropractic care are highlighted. Order a pack of 25 today! Post surgical continued pain patients may have an opportunity for relief. Drs. Kruse and Cambron report on 32 cases of failed back surgery patients who continued to have pain after their back surgeries. Treated with Cox Technic flexion distraction, these patients found relief. 41% overall in patients who'd had back surgery. 57% in patients who'd had surgery with a fusion. Read the research paper in the Journal of Manipulative and Physiological Therapeutics, then, contact us at info@coxtechnic.com. If you are the patient who suffers with continued post surgical back pain, consult a certified physician in Cox Technic. If you are a doctor interested in helping these patients, please check out our educational options.